We are now starting to save. My wife and I are saving for a brand new Great Wall Peri. Great Wall Motors is a Chinese brand but is now available in the Philippines. They introduced 6 models last year, namely the Hover (a CUV), Wingle (a pick up truck), Cowry (a van), Cool Bear, Florid and the Peri. The nice things about the newly introduced vehicles are 1) they are not as expensive as other cars in the same class and even have better features, 2) the ones that have gasoline engines are EURO 4 passed and those with diesel are EURO 3 passed, 3) the entry level model, the Peri is fully equipped with safety features such as ABS and EBD, dual airbags and side impact beams. Brand new cars have a 3-year warranty or a warranty of up to 100,000 km. The cars of Great Wall Motors Philippines have the best value for money because the features one gets are all worth more than what is paid for. Their parts are very much available here and costs like the other extreme of Ferrari parts. 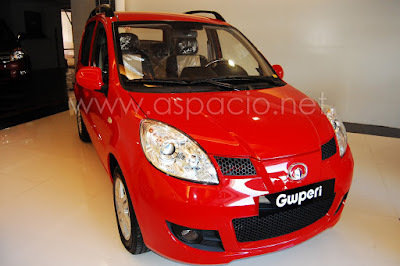 If things go well with our income through the internet we will be able to drive a brand new Peri by Great Wall Motors soon. Bungee Fun at Eastwood City: What an Experience!